My first proper post with my new look blog. I also decided to change the background on my photos, but I'm undecided on the result. The lighter background does seem to help the light in my pics a bit more. My previous post still has me thinking on what kind of blogger I'd like to be. One thing for sure it, not one that needs to be glued to the laptop. So I'm trying to focus on taking better photos with my iPhone, that require no lightening or editing, other than my watermark and a crop.... These 2 things are what I usually do anyway. But if my photo is better to begin with, that's half the battle. Now onto the polish. Firstly the accent nails. 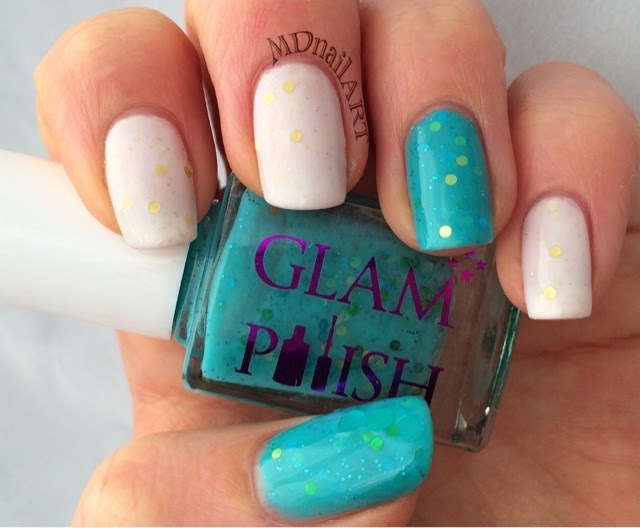 This is Glam Polish's Lucky. I just love that colour, but that's no secret. It has a scattering of turquoise and green glitters. A subtle amount of bling for this colour. This is 3 coats. I may have been a bit heavy handed applying it, but in future I will probably layer it over a similar base colour. And this is Liquid Sky Lacquer, Eternal Promise. It is a milky white base with gold scattered glitter. The larger glitters sometimes seem quite green, so it matches quit well with the Glam Polish. How "Lucky" is that? This too was 3 coats, so again, layered over a decent white base will help the expensive stuff go a bit further. 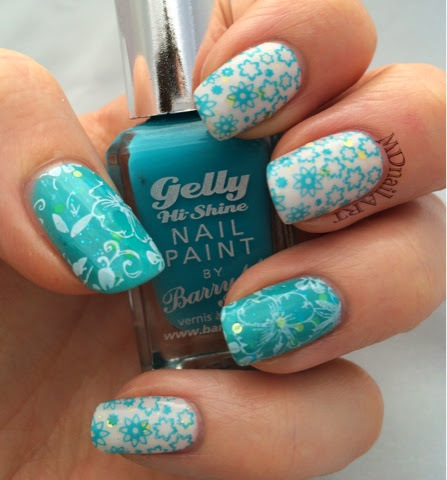 I had no idea where I wanted to go with this mani, so I turned to the stamps, and my fave Barry M Gelly - Guava. Mmmmm. 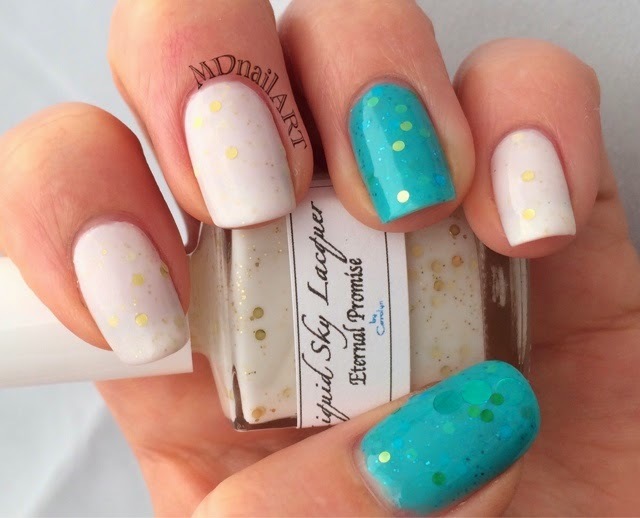 I stamped the guava with MoYou Fairytale Collection 05, and Konad white with MoYou Pro Collection 10, stretching the image to fit my thumb. I rarely wear white, but I am pleased with the result.